As holistic financial planners, we believe it’s just as important to understand you and your values as it is to understand your financial goals. You can learn about our process by reviewing the graphic and detailed descriptions below. This meeting is all about you. We spend as much time as needed to get to know each other and have a solid understanding of your values and goals. At the profile meeting, we will replay back what we heard in the discovery process to make sure we are not only understanding the financial aspect of your life , but also your dreams, values, and aspirations. This is also a time where we will make a formal proposal in working together. In order to provide you with our best recommendations, we will need your most updated financial information. The financial planning organizer is designed to help you get organized and get us the information requested as seamlessly as possible. 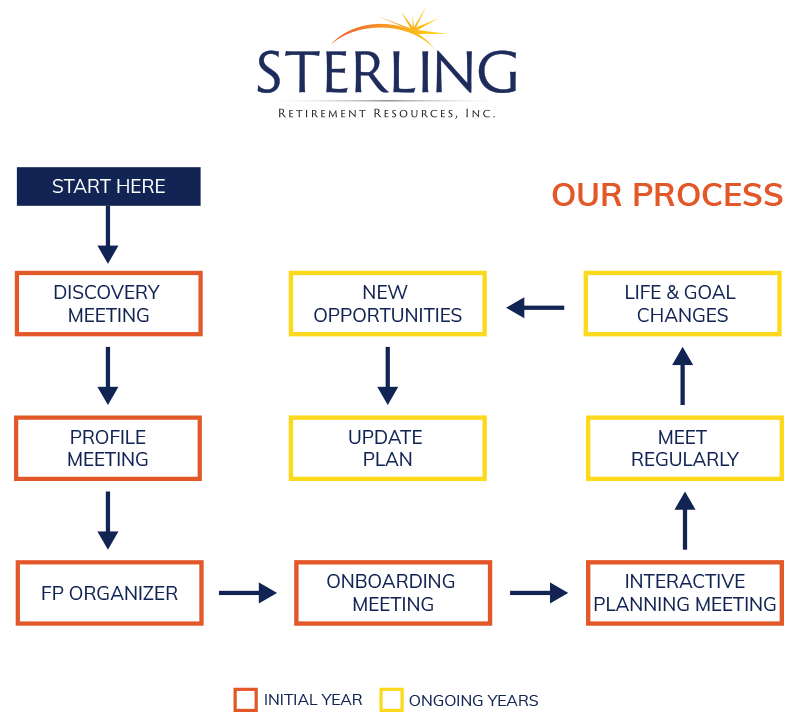 Our onboarding process begins when you decide to come on board as the newest member of the Sterling team. Typically there is paperwork involved as the first step of the onboarding process and this helps jumpstart the planning relationship. This is when the magic happens. Over the course of several planning meetings, we’ll partner with you to help map out your route to get your from where you are now, to where you want to be! These meetings are tailored specifically to you. Keeping your plan up-to-date is key to keeping you moving toward your goals. We recommend a regular meeting – at least once a year – to make sure everything is accurate. During these regular meetings, we’ll identify life and goal changes that may affect your plan. This could include a career change, the birth of a child or grandchild or a death in the family. At Sterling, it’s our job to stay tuned into any opportunities that could bring you closer to meeting your goals. During these regular meetings, you’ll have the chance to learn more, ask questions and decide whether or not a new opportunity is the right fit for you. After identifying your life and goal changes, and discussing new opportunities, we will update your plan accordingly. Questions about our process or about Sterling Retirement Resources? Check out our frequently asked questions.